The National Coordinator for United Kingdom is Irene Marillat (email klquknatorg[at]gmail.com). For any inquiries about the UK national competition please contact the National Coordinator listed above. The Kids' Lit Quiz is a major national celebration of books and reading imported to the UK from New Zealand, which offers irresistible reading challenges, broadens awareness, is hugely motivating for boys - and, best of all, is great fun! Our KLQ UK People page provides an overview of the main people involved with Kids' Lit Quiz UK. Looking to develop your CV and develop contact with like minded librarian colleagues across the UK? – Then look no further! The Chairman and Trustees of the Kids’ Lit Quiz UK are looking for a Regional Organiser for the coming year and beyond, for South West England (based in the Plymouth area or near the Devon/Cornish border), to join our happy team of volunteers. The KLQ UK hold 19 Regional Heats up and down the country which culminates in a a grand National Final, normally held in London. The winning UK National team are then invited to enter the World Final the following year, which would take place in one of the other participating countries. Wayne Mills, our Founder and Quizmaster, asks questions on children’s literature and it could be anything from the Comics to the Classics. There is no reading list. The Regional Organiser would be responsible for contacting schools to enter teams of four students from years 6, 7 and 8 to compete for the Regional cup, to collect the entry fees and complete a Returns Form to be sent to the National Treasurer, and to provide a venue (usually a School hall) to hold approx 20 teams and supply light refreshments. All expenses are paid. A list of Guidelines will be sent on request. 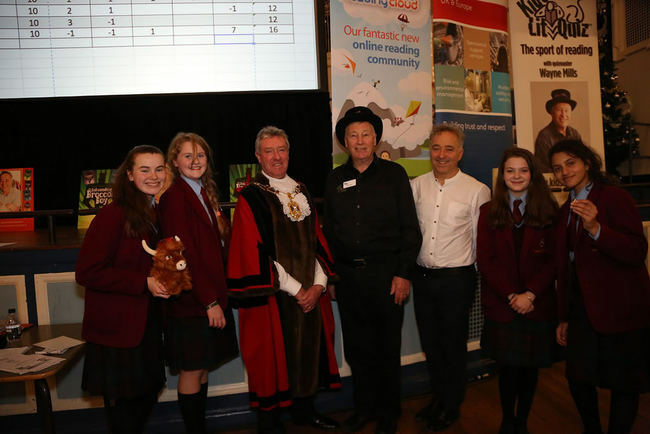 Kids' Lit Quiz UK gained charity status on 2nd December 2015. For full details please see our Charity Status page. The winners of the 2018 National Final are Enniskillen Royal Grammar School. There are 20 forthcoming United Kingdom fixtures. Coming up next: West Scotland Heat, Wednesday 30th October 2019. You can view full details of past United Kingdom fixtures on the Fixtures Timetable. Photos from UK heats and finals can be found on our Photo Galleries page. Serco is a leading Service Provision company for Government contracts, including training and development. Pan Macmillan is the UK general book publishing arm of the Macmillan Group, which operates in over 70 countries. Its imprints include Macmillan, Mantle, Pan, Picador, Bluebird, Boxtree, Sidgwick & Jackson, Bello, Tor, Macmillan Children's Books, Campbell Books, Macmillan New Writing and Macmillan Digital Audio. Pan Macmillan was named Publisher of the Year at The Bookseller Industry Awards in May 2015. Capita Reading Cloud provide market leading library management solutions, combining professional library management tools with a range of user friendly and visually engaging student interfaces. Using a wide range of innovative features and mobile apps we are able to promote reading for pleasure amongst students and essential reporting for educators and parents. Softlink has worked with schools for more than 30 years. We deliver library, knowledge and content management systems that enhance how library and learning resources are discovered delivered and managed. The School Library Association (SLA) is committed to supporting everyone involved with school libraries, promoting high quality reading and learning opportunities for all. The KLQ are indebted to the SLA for their continued support and also for donating Training Vouchers for the Librarians with the winning teams. By bringing together the greatest stories, brands and authors of any global children's publisher, Penguin Random House Children's are here to help create and rediscover heroes for each new generation. Full of wonder and intrigue, Discovery Box magazine is a fantastic and fun aid to your child’s learning. With dedicated sections on subjects like science, nature, history and geography, it’s loaded with facts and fun. There are comic strips, games and experiments to try at home, all with one aim in mind: discovery. The following organisations and companies provided book donations for the 2017 UK heats and finals. The Trustees and Management of KLQ UK wish to express their heartfelt gratitude to our Patron, Miss Judith Hanratty CVO OBE, Chairman of the Commonwealth Education Trust, for her continued support and generosity, and we are indebted to Mrs Ena Harrop, the Head Teacher of The City of London School for Girls, for the use of their premises; to The School Library Association for their support, to the many authors who give up their time to attend events, to the teachers and librarians who encourage their schools to take part, and to all the many volunteer helpers across the UK. Special thanks must also go to our amazing photographer KT Bruce for her support over the years.